Always eclectic in my soul tastes I began to promote the music of Smooth Jazz into Europe in the 90's as an extension of jazz-funk fusion because of its obvious RnB tendencies and the quality soul vocal tracks that always found themselves to be tucked away usually on track four!!. Since then the genre has largely been watered down for US radio and I myself have been frustrated at the fairly recent emergence of albums that are nothing more than music for the background and fodder for the radio. 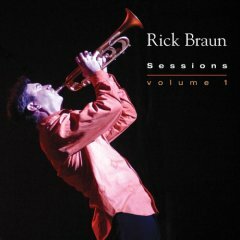 Rick Braun along with Boney James was one of the original Smooth Jazz superstars which is one of the reasons that I was surprised by this album. Firstly, from the very first beat it IS downright funky and there is no track that is shorter than four minutes in length. In fact most of them average over six. It is clear that Rick wishes to remain true to his musical roots which began in the fusion group Auracle. Maybe it's because he now has the money to do so, he is co-director of the label together with another smooth jazz pioneer, Richard Elliot. Importantly, though the quality of music is what counts and this 'live' album of concert favourites is firmly at the top of the pile. Confusion may reign on the release date as the album was originally recorded in 2004, but the tracks will always stand the test of time. The musicians have the freedom of a live session and that comes over most in the happy vibe created by the cover of the Friends Of Distinction's 'Grazing In The Grass'. Braun's trumpet playing throughout is crystal clear and jazzily melodic, which of course is the basis of fusion. Vocally to the fore on his own composition 'Love will find a way' he delivers the lyrics similar in style to Herb Alpert in that it is a gentle method based on the fact that he does not feel strong in the role. Though as with Alpert that itself becomes appealing and the reason the track is so strong. 'TGIF' conjures up perfectly that end of the week feeling and brings the groove back. There is no doubt that the musicians enjoyed themselves in the making of this record which for those of you who wish to explore the variations of modern fusion is a perfect start. For those of you like me who were beginning to despair with the lack of originality with a genre that once promised so much in the forward transition of soul/RnB music my faith has been restored. Apparently not on general release until the end of August it's worth the wait!